In the quarter ending December 2014 (Q3FY’15 – India), AirAsia India, an associate of AirAsia due to the latter’s share of 49% in the India venture, posted a net loss of INR 21.7 Crores. In the same quarter, spanning the months of October, November, and December 2014, the airline faced a significant challenge. The airline was faced with a shortage of senior cabin crew, effects of which were largely seen in November and December – very significant delays of many flights (up to 5 hours and more) and the cancellation of some. The airline was forced to play around with its schedules to match the flight duty time limitations (FDTL) of its senior crew, which resulted in the delays and cancellations. Cancellations at AirAsia India rose from 0% in October to 2.65% in November, and dipped to 1.92% in December. In the quarter, a total of 4,019 passengers were affected by delays more than two hours (2% of the passengers carried in the quarter), and 513 passengers were affected by cancellations (0.2% of the passengers carried in the quarter), as per DGCA data. In the quarter, the airline flew a total of 201,000 passengers, out of 253,852 seats, resulting in a load factor of 79.2% for the quarter. In the month of November, passengers carried dropped to 61,000, down 5,000 passengers compared to October, while load factors increased to 79.8%, up from 76.2% in October, perhaps indicating that the loads in November were driven by servicing affected passengers. December is a month of high domestic travel demand. December 2014 was AirAsia India’s first month of operations in a high demand season, which resulted in domestic load factors rising to 81.5% – its highest since start of operations. Considering that the target customers for AirAsia India are leisure travellers, AirAisa India was expected to have recorded higher load factors. This figure was the lowest among all airlines in India for the month, either due to the airline’s limited network or an image that was impacted by the high number of cancellations and delays that continued into December. AirAsia India ended the quarter with a fleet of 3 Airbus A320 aircraft, of which two are used (from AirAsia Malaysia), and one is new (directly received from Toulouse). The third aircraft entered commercial operations on 18th December 2014. In the quarter, the airline added only one destination to its network – Pune, on the 17th of December 2014, while doubling the frequency on the Bangalore-Jaipur sector, and halving the Bangalore-Chennai frequency. The airline presently services Chennai, Cochin, Goa, Chandigarh, Jaipur, and Pune from Bangalore, and Jaipur from Pune. As per AirAsia, AirAsia India will receive just three additional aircraft in the year 2015, raising its total fleet to just six (6) aircraft by the close of calendar year 2015. All three aircraft will be used (older) airplanes from AirAsia Malaysia. In the same year, the group will receive only five new airplanes from Airbus, of which one will be for Malaysia AirAsia, two for Phillipines AirAsia, and two for Japan AirAsia which presently has no aircraft. AirAsia India is forecasted to have a load factor of 81% in Q4 FY’15 (Q1 CY 2015). This may seem difficult considering the airline is entering another lean season, and its past performance in both lean and peak seasons hasn’t been encouraging enough to support this forecast. 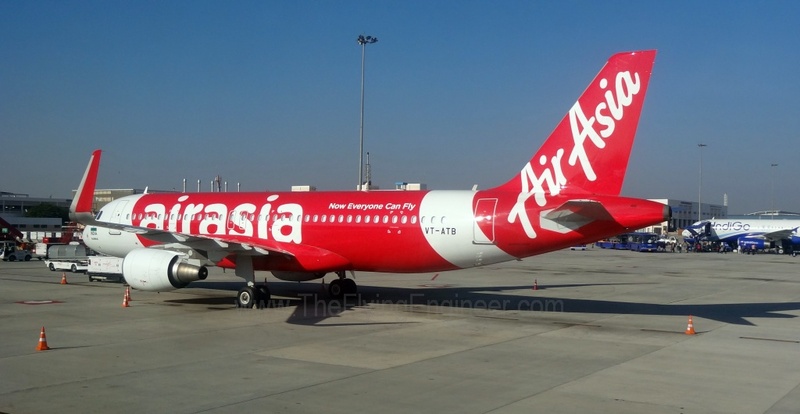 However, one tactic that the group may resort to is to feed traffic from Malaysia AirAsia and Thai AirAsia into Bangalore, which can then be picked up by AirAsia India to offer more connections in India, such as Jaipur, Chandigarh and Goa to passengers of the other two AirAsia associate airlines. AirAsia’s A320NEOs will be delivered only at the end of calendar year 2016. Further, in 2015 and the next few years, the group will not be taking in large number of aircraft every year like before, in an attempt to preserve cash. For the quarter, Thai AirAsia was the only associate to record a net profit. Indonesia AirAsia, Malaysia AirAsia, Philippines AirAsia, AirAsia Japan and AirAsia India recorded net losses. Indonesia AirAsia and Malaysia AirAsia however recorded operating profits. 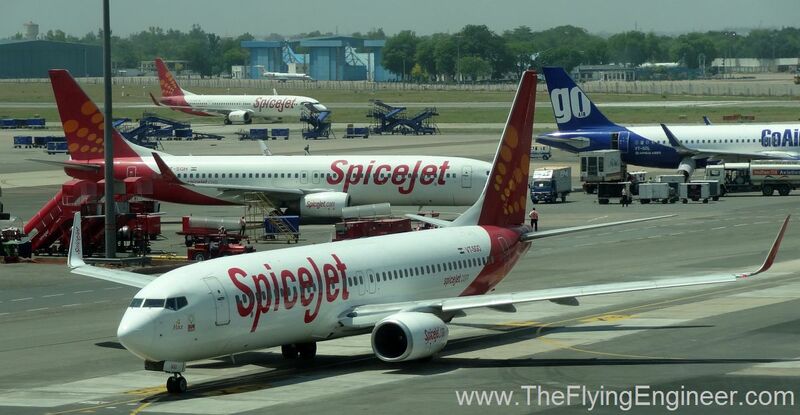 Could SpiceJet spring a surprise with its Q1 Results? 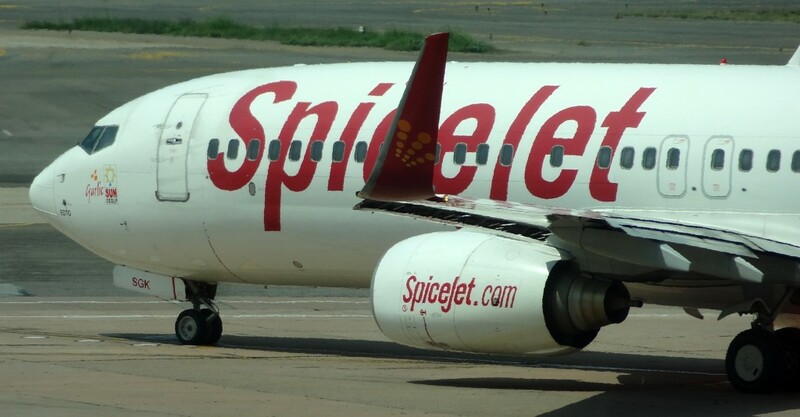 It is widely believed in the industry that SpiceJet may post a Q1 loss. Some were convinced, based on personal estimates. Others heard whispers. But, there could be some hope. 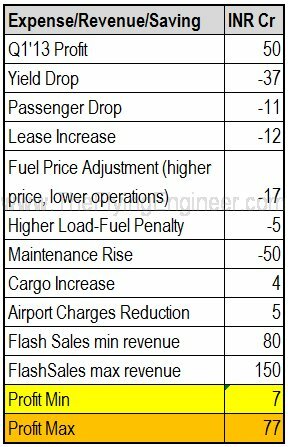 The Flying Engineer redoes some numbers to show how SpiceJet could (but not a guarantee that it will-this is purely an academic exercise) spring a surprise on a nation that is so used to seeing the red airline in the red. The airline started steering a different course with Chief Operating Officer Sanjiv Kapoor: the classy man heading SpiceJet at the operational front. The bigger turning point was when he restructured his top management, and bringing on board the new Chief Commercial Officer Kaneshwaran Avili, who is ex-AirAsia and ex-Tiger. To some of us who watch the industry, we are in absolute awe of Avili, not only for what he’s done, but for what he’s doing. There were other posts that got a fresh nameplate, but the biggest changes are the COO and the CCO. Sanjiv, with his legacy experience, is all set to change the brand (image and offering) of SpiceJet, positioning itself as not a low cost carrier but a classy low cost carrier that caters, however limited, to the business crowd. Not surprising, as corporate flyers make most of SpiceJet’s bread and butter. Avili, on the other hand, is keen on aligning the low cost carrier with global best practices for such airlines. In short, Sanjiv caters to the first few rows of the aircraft, while Avili tries to work with the later rows in the cabin. A great combination, in our humble opinion. You could have the best team, but in the end, all that ever matters are results. This is where the optimists and the pessimists are divided. For one, media reports (and verified true) of employees not receiving their form 16 from the airline is making most wonder if the airline has only sunk deeper, exhibiting the symptoms that plagued Kingfisher just before its downfall. These are the whisper driven crowd. The optimists-some of whom (and who are just a handful) have reason to believe that the airline’s results – numbers – may have a different story to say, and maybe even spring a surprise on everyone. To the numbers we March. Beyond March-and before July make up the first quarter of the financial year. As shown in a previous analysis of SpiceJet by The Flying Engineer, there is a strong correlation between the passenger load factors and operational profits. April was a disappointing month for Spicejet (and few others), with domestic load factors that slumped compared to the previous year-for all carriers except Jet Airways and its low cost arm JetLite. 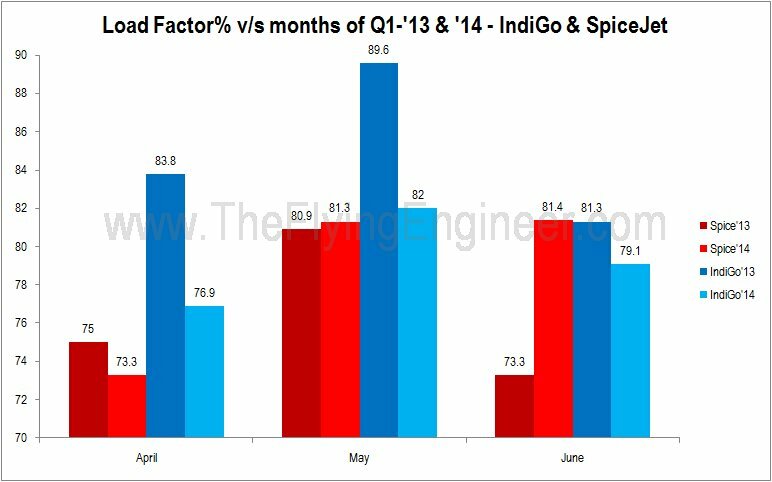 In May, SpiceJet recorded and increase, and in June, displayed the best load factor increase performance, while IndiGo has been the only carrier to be in the negative for all three months of Q1. The second month of Q1-May-is typically the peak season for domestic travel. Yet, all carriers except Jet, Jet Lite, and SpiceJet reported a drop in load factors. Was there a slump in the demand for travel? Year on Year (YoY), the Q1 of FY2014-15 recorded a 7% growth in domestic passenger traffic, while international recorded a 10% growth in traffic. Air Costa has grabbed less than 1% of market share, making us disregard the airline as a contributor to capacity increase. Overall, among the legacy full service and LCC carriers, capacity has increased far greater than demand, leading to low load factors. But SpiceJet has done the opposite of IndiGo-it has slashed capacity in terms of seats, and ASKs. By pulling out six aircraft from its fleet, and with one Q400 temporarily grounded, it has deployed lesser capacity, but has managed an interesting result. SpiceJet’s fleet has shrunk from Q1 FY13 – sending off 2 Boeing 737s, and preparing six to be sent back to their lessors: 2 scheduled, and four early return, while adding 5 new 737 aircraft, including the latest 737- the infamous ‘Red Chilli’ with a special livery. Compared to Q1 FY13 SpiceJet seems to have had 3 more airplanes on its books, but three less operational aircraft (as six were being prepared for return). One Q400 may have been down for a fairly long period. 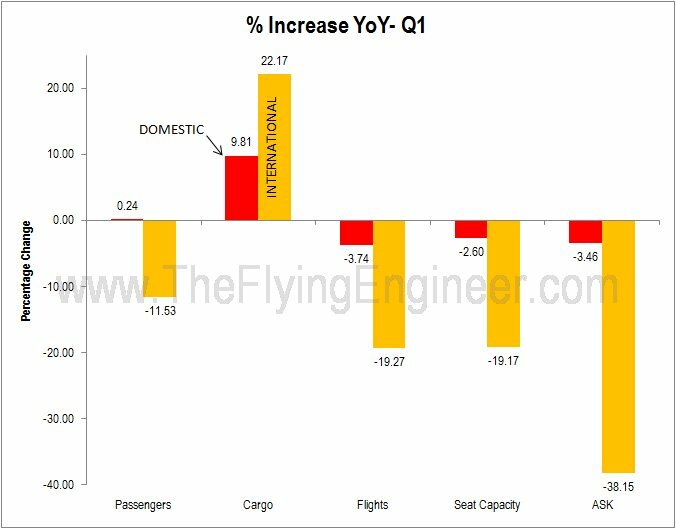 While the available fleet has shrunk, very interestingly, SpiceJet has performed positively with respect to a YoY growth when it comes to domestic passengers and cargo carried. These are sources of revenue. It has also shown a negative growth as far as flights, seat capacity, and available seat-kilometers are concerned. These three are sources of costs, which means the costs have reduced. These are numbers from the airline. Overall, revenue indicators have grown, while cost indicators have shrunk. This can only mean one thing as far as direct operations are concerned: profits. And a similar encouraging trend is also seen in its international operations, which are just 10% of the airline’s overall deployed capacity (ASK). There, the fall in the number of passengers is small compared to the reduction in international ASK. Overall, in Q1 FY14, SpiceJet flew just 23,400 passengers lesser than Q1 FY13, or just 0.7% lower. Which is impressive, in the face of a much higher airline capacity reduction. Cargo carried in Q1 FY14 is much higher than Q1 FY13, showing an increase of 10%, or 1,868 tonnes extra. Of those direct operation figures, as far as passengers are concerned, some seats are low yield seats, as these were promo seats sold across five sale campaigns: ‘Super Summer Sale’, ‘Super Holi Sale’, and three ‘Fly New Network’ promos. The Summer sale was more an early sales drive, not exactly a ‘sale’. 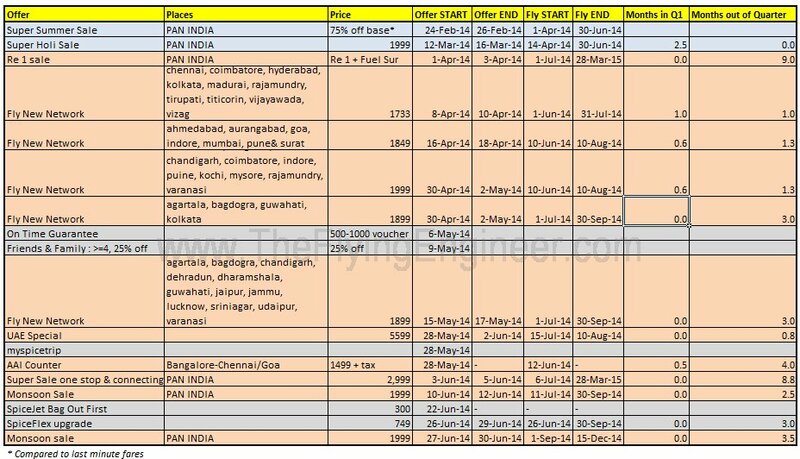 The ‘Super Holi Sale’ offered INR 1,999 tickets in Q4 FY13 for travel mid June onward (bookings 90 days in advance) – or just 1/6th of Q1-in June. Three ‘Fly New Network’ sales in Q1 FY14 were for flights in June, July and August, of which two were for travel only in 2/9th of Q1-in June. Since April and May are peak domestic travel seasons, no significantly low ‘promo’ seats were offered in those two months. Which means that the higher load factors in the month of May are largely a result of normal sales. But in June, SpiceJet recorded incredible domestic load factors, making it the second highest (after Go Air), allowing the red airline to lead IndiGo in occupancy. Compared to Q1 FY13, the June domestic load factor in Q1 FY14 rose by 8.1% – or 107,466 passengers. If we assume all these passengers paid around INR 1,999, which means the airline took home a minimum of INR 1,500 (After UDF and ST), then the airline’s average yield (domestic) may have fallen by around INR 120, assuming an average passenger yield of INR 5,000 for regular sales. If one is to disregard the 10-lakh seats SpiceJet offered at INR 2013, which included travel in April 2013, then the promos in 2014 may have translated to a passenger revenue reduction of INR 37Cr, compared to Q1 FY13. This does not mean the airline is losing money because of promo sales. Had these promos not been in place, the airline may have flown lesser passengers, taking a larger hit on its direct passenger revenue through lower sales and lesser stimulation. IndiGo, for instance, carried 687,000 more passengers in Q1 FY14 compared to last year, but added 1.24 million seats, leading to seat capacity deployment that was beyond demand. But considering SpiceJet has managed to fly more passengers with lesser capacity, probably in part because of the changes within the airline- new service, better cleanliness, better service, improved frequency, better timings, and better on-time-performance, the airline may not have sold as many promo tickets as estimated, but probably sold more regular fare tickets, bettering the 37Cr estimate. In addition, SpiceJet held 11 sales campaigns in Q1 FY- thanks to Avili who took over the role of CCO in Q1 FY14- of which all included flights in Q2 Fy14, and only three included few flights in Q1 FY14 (The Fly New Network sales). Since statistically, demand in Q2 of any FY is weaker, more seats were up for sales. With an approximate 3.75 million seats flown (offered) in each quarter, and conservatively assuming 10% of it was up for promo sales, more than 500,000 tickets may have been sold at an average price of INR 1,777, leading to an additional revenue of INR 100 Crore. That 100CR sales were for tickets that need to be serviced in Q2 FY14 and beyond. This only means that the airline has sold more tickets than it has serviced in Q1 FY14, leading to more revenues from operations, while not incurring the costs associated with servicing those ticket sales. With the flash sales triggering a market stimulation, approximately INR 10-50 Crore or more worth tickets may have been sold purely through stimulation. The flash sales have had two effects: shoring up capital, and destroying the notion of a season, proving that seasons are in the hands of the airline. 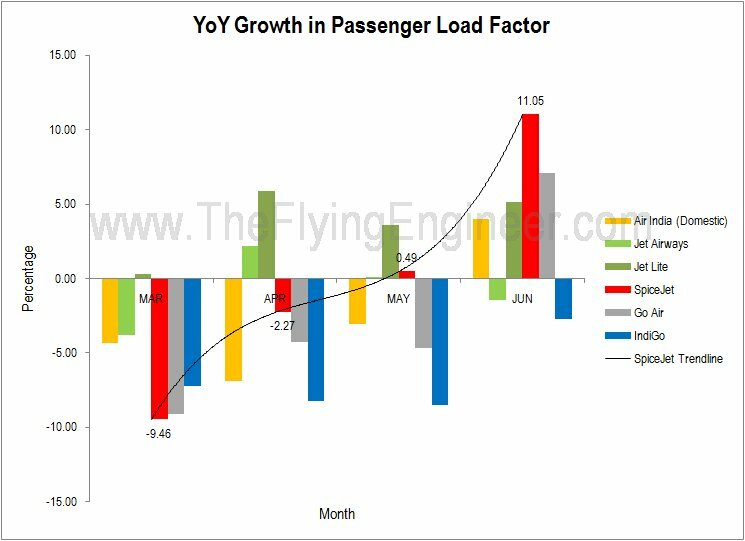 June, which was to have been the onset of the off-season for domestic air travel, has recorded the best load factors, making it a lucrative month, and carrying fuller airplanes (on domestic) than IndiGo in the June of Q1 FY13. Part of SpiceJet’s rebranding was the commercial interest involved with the introduction of preferred seats (where passengers may pay higher for ‘Max’ seats which are the first few and emergency exit seats which either offer better legroom or promise faster boarding and deplaning), and the hot meals with TAJ SATS and CCD. The ancillaries from these introductions are pronounced in June 2014, as the hot meals were introduced towards the end of May of 2014. With these introductions, and the higher number of passengers flown, SpiceJet could have realized higher in-flight ancillary revenue in Q1 FY14 compared to Q1 FY13. For the Q1 of FY13, SpiceJet reported a profit of INR 50 Crores. One of the largest disproportionate expenses for the airline, in FY13, was maintenance: INR 993Cr, most of which was contributed to in H1 FY13. Over quarters, the maintenance cost averages to INR 250Cr. In Q1 FY13, the maintenance cost was INR 200 Cr. 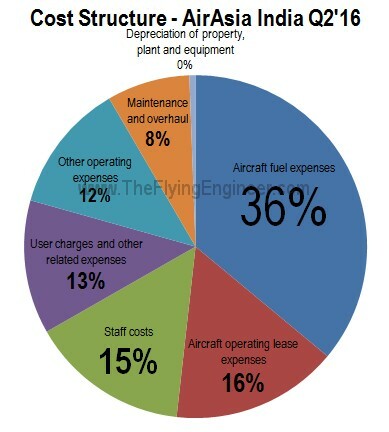 If the maintenance costs prevail, due to activities associated with aircraft being configured to lessor-return conditions, then compared to Q1 FY13, the maintenance cost overrun is INR 50Cr. Although six Boeing 737s were withdrawn from operations, there were three extra 737s on the books, compared to Q1 FY13, which together add about INR 12Cr in lease over the three months, over Q1 FY13. Compared to Q1 FY13, fuel prices in Q1 FY14 have risen by an average 10%, while ASKs have fallen by about 7%, resulting in a net fuel price increase of INR 17Cr. Overall, flights in Q1 FY14 have fallen to 95% of that in Q1 FY13, resulting in airport charges reducing by about INR 5 Cr. Flight crew salary hikes were not effected in Q1 FY14. Cargo carried has gone up by 10% in Q1 FY14, contributing to INR 4 Cr of revenues over and above that in Q1 FY3. Passengers in Q1 FY14 have dipped by 23,400 when compared to Q1 FY13. Assuming these passengers could have been regular fare paying passengers, the airline may have lost INR 11Cr. In addition, due to the promo fares, the airline may have lost INR 37Cr in the form of average yield reduction. The lesser flights but higher passengers and cargo per flight translate to an average 500kg increase in payload, per flight, which introduces an average 0.65% fuel burn penalty, which translates to INR 5 Cr. However, the airline may have shored up to around INR 150Cr from the sales in Q1 for services in Q2, and the market stimulation drive. With this, the airline may report a two digit profit (though we’d love to see three), and a single digit profit or a very modest and negligible loss, at worst. It must be noted that proceeds due to ancillaries haven’t been considered, which will increase profits. These profit/loss projects are very approximate, conservative, and willfully skip few other factors that influence cost, and may not hold true in case the airline paid off certain dues from previous quarters (if such rumors of unpaid dues are true) in Q1 FY14, in which case the airline may slip into losses against the above projection. If the company’s declared results are as analysed above, SpiceJet is on its way to a positive transformation. With all it’s heart.